Lisa Robin Kelly, OMG! What happened to you? Can you believe the little knockout above has turned into that hag on the left? 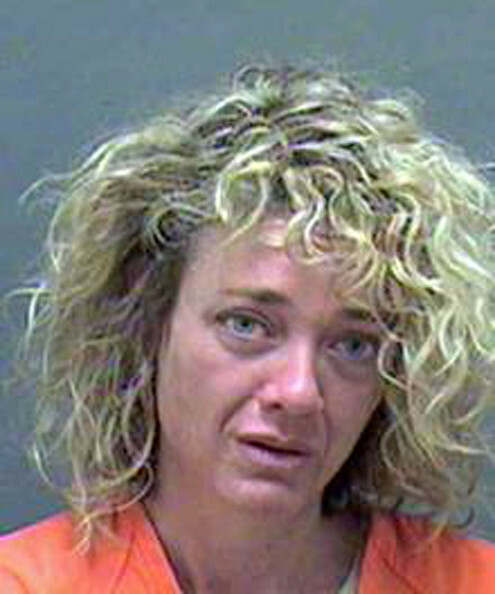 To be sure that’s a mugshot (arrested for – what else – drinking and driving) but she is barely recognizable. What’s with the deep troughs around her nose and mouth? That looks more like LRK 30 years from now, rather than, well, now. The once gorgeous LRK made her first TV appearance in 1992 on Married With Children. Five years later she had another part on Married. She has also had guest roles on Murphy Brown, Silk Stalkings, The X-Files and Charmed. She had a small role in the successful film Jawbreaker. She landed the role of Laurie Forman, Eric’s promiscuous older sister on That 70’s Show but was fired after 3 years. She made another appearance in four episodes during the 5th season but eventually was replaced. In 2005 LKR appeared in the movie The Food Chain: A Hollywood Scarytale. To see Lisa in That 70’s Show click here. To see Lisa in Married With Children click here. Lisa left That 70’s Show due to difficulties with alcohol abuse. She was arrested for drunk driving on August 21, 2010 and sentenced to 12 months of unsupervised probation in North Carolina after pleading guilty to drunken driving. To read the article click here. This entry was posted in Celebrities Who Bottomed Out and tagged Laurie Forman, Lisa Robin Kelly, Murphy Brown, Silk Stalkings, That '70s Show, X-Files. Bookmark the permalink. Do not condemn Lisa, because you all never know what is going to happen to you or your loved ones in life. We can only feel sympathy and hope other will learn from her mistakes. Robert Downey Jr was a drunk too… Look at him now. Might be a little hasty on the ol’ drunks there. Very great post. I just stumbled upon your weblog and wanted to say that I’ve really loved surfing around your blog posts. After all I’ll be subscribing for your feed and I’m hoping you write once more very soon!